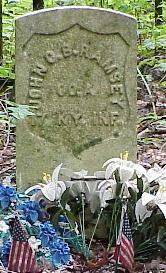 John C. B. Ramsey enrolled in the 17th Infantry on November 1, 1861 for a three-year enlistment. He was mustered at Calhoun on January 3, 1862. He served until his discharge on January 23, 1865 in Louisville. There are no further comments in the AG Report. He is located in a private burial plot near Eddyville, Illinois in Pope County.